Set includes: Toilet Brush & Holder, Soap Dish, Tumbler, Soap Dispenser & Toothbrush Holder. Toilet brush & holder: H38 x W8.5cm. Soap dispenser: H16.5 x W7.3cm. Soap dish: H3 x W11cm. 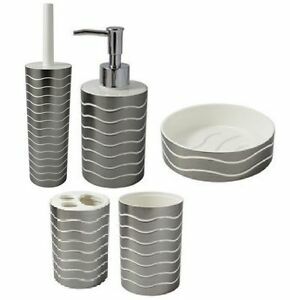 Ice Collection Silver White Bathroom Accessories Set.